What to blog about – finding your niche! I remember when I started my first blog many years ago, how excited I was, looking at other successful bloggers and thinking that it’s gonna be the same for me. Little did I knew that blogging is more complicated than we think. Since I was writing about every single thing that came in my mind at that time, with no direction, no purpose and no knowledge of how anything related to blogging worked, I failed big time! That was okay because I learned my lesson and after a few years I started MihaBalan.com instead. This article is here to help you in case you are struggling, deciding on what you should blog about and to help you get started if you haven’t yet. So let’s say you have some cool ideas that you would like to share with the world and you are thinking to start your own blog. That’s awesome, blogging is a hot career right now and if you do it right, it can actually be your dream job. Let’s start from the bottom, you need a good and trusty platform to rely on. I use WordPress because it’s free, easily customized and very well supported. You can basically use it in two different ways. Either you have your own hosting platform or you use WordPress.com (I am sure there are others, but these are the most popular ones). WordPress.com is fully managed hosting by the makers of WordPress. it’s easy and free, but it’s quite limited in what you can do, what plugins you can use and what themes you can use, compared to when you host it yourself. It also has a reputation of being extremely strict with their rules and they have closed blogs before. A good compromise is a managed hosting platform such as Bluehost, you get all the benefits of a self hosted platform and they handle all the technical stuff such as installing WordPress. It’s the best of both worlds really, but you pay a small fee every month, $3.5/month for the basic package which will do for most. You can find clear instructions on how to get started with blogging on Bluehost here. 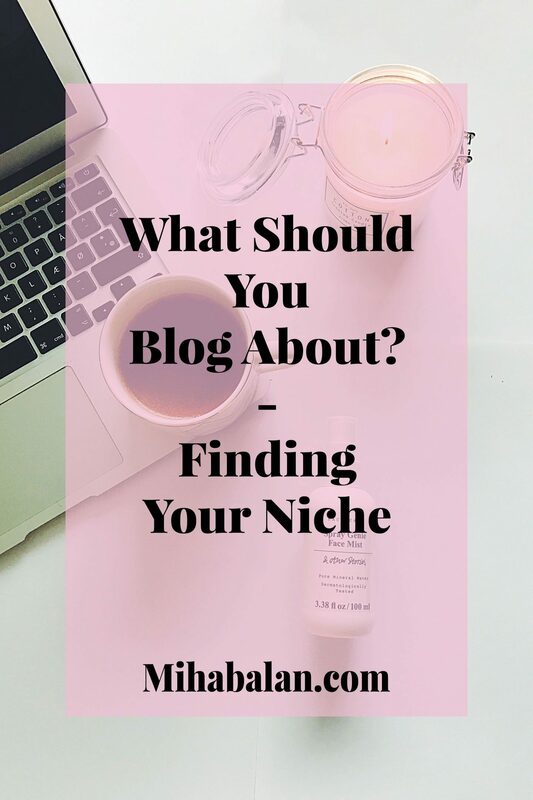 After you decided on a platform, now it’s time for you to focus on what you will write about, what your blog should be about – finding your niche. Niche, what does niche mean? It’s that particular interest that you focus on and that your blog will center about. It can be fashion, food recipes, lifestyle, beauty there are so many that you can choose from. The smaller the niche, the more dedicated and targeted readers, but also less potential people that you can reach. When I first started this blog, my thought I would write motivational and personal development articles but since I have always passionate about clothes and developing my personal style, I started writing about that also. It got a bit confusing for a while to be honest but in time it helped me build the right niche for me, that combine both of my passions. Finding my niche, helped me grow my audience and reach more people which is what I was aiming for. What do you to write about? This is the fun part about blogging and probably the most important. First, take a piece of paper and write down. What are your skills, talents or what are you really passionate about? Write everything down, even if you think they are not relevant to blog about, the bigger list the better. While writing this list, don’t be too hard on yourself, think about all your accomplishments, it doesn’t matter if they are big or small. If you have any problems finding the right skill or area of interest, ask your friends or parents. What comes to mind when they think about you? That can be inspirational. We all have certain things that we are good at but we have also those that we are good at but do not enjoy doing it so much. For example, I was good at my previous job but did not enjoy doing it so much. My heart said yes, great colleagues, great position but my brain said “why do you struggle to go to work every morning”? The same here. From the list you made above, what are the things you also really enjoy? Takes this opportunity to eliminate the ones that you don’t enjoy doing. So now your list got smaller and you should have a better idea of what you are good at, passionate about and enjoy doing in the same time which is great. This is a big step in finding the right niche for you, good job. But what about your readers? What’s the message that readers should receive from visiting your blog? Many people say that if you write or present a subject that you are passionate about, eventually readers will come. Sure they will in time, but a better way to attract the readers would be to build the niche that you are passionate about in a way that is also useful for them, otherwise why would they visit your blog? I suggest you choose from the remaining points on your list, those subjects that you have the skills for and love talking about and that you think would be useful for others. For example, if you decide to be a fashion blogger, something that is very common at the moment, you like to style outfits, shop and have a lot of experience about the newest trends. When you write about the subject, do it in a way so that people can use your fashion advice, they can see you as personal stylist or if they need some style inspo they know they can come to you. Like Brittany from Zanita says, find your “it” factor which is the reason why 4% of those big bloggers that you see on social media succeeded. Writing is a big part of your blog, just as good and creative pictures are. You don’t need to be an expert writer or take a lot of courses because writing gets better with practice and good content will help you grow. So, If followed my steps, you should now have narrowed down some ideas of what your blog should be about. I am excited to read what you came up with, if you found your niche or if you struggle with starting your blog, let me know.